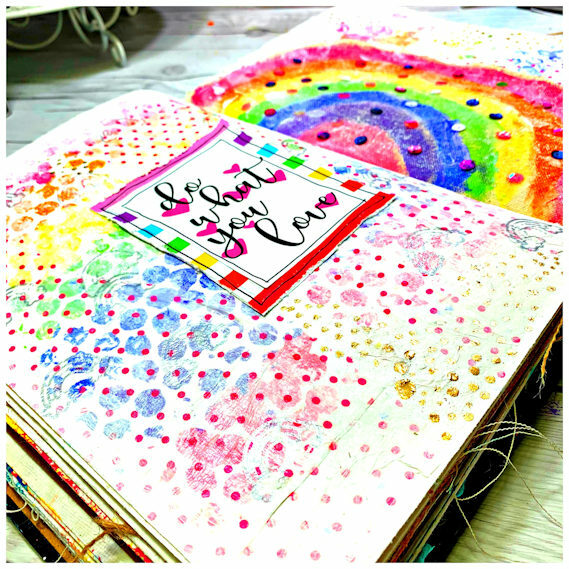 I’ve got back to my mixed media art journal! I’ve missed just getting messy with acrylics so I thought this kit was perfect for a light, bright, colourful easy page. First, I cut the canvas material page into a semi-circle that would later become a rainbow. 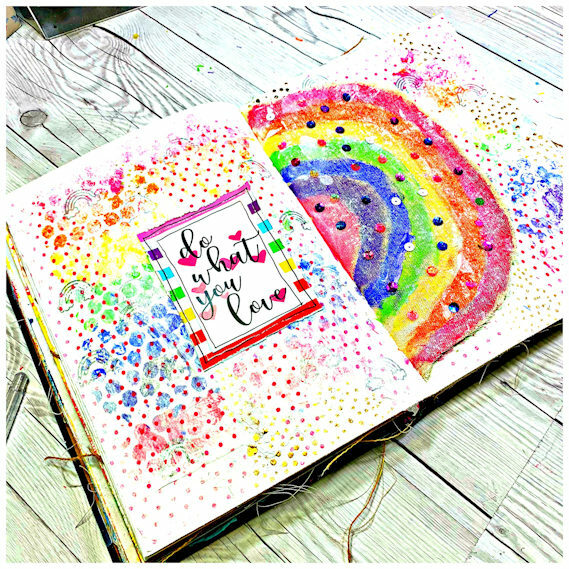 I used Dyulsions paints to create a rainbow bubble wrap pattern background, then stuck the lovely dotty tissue paper on top with Mod Podge matt medium. I toned down the colours by using gesso and a brayer so the colours would fall more into the background. I also used gesso on the rainbow because I felt the colours were rather bright. Then I took a hard bristled paint brush and to gesso around the edges to create a hazy border. I cut up the Zine for the quote, stuck it onto the rainbow striped paper then got out my Tim Holtz distress tool to distress the edges to create a bit more interest. I used my hot glue gun to stick the sequins onto the rainbow I painted. Then I did some finishing touches with a silver glitter pen and a gold leaf pen. Hope you are enjoying this month’s kit as much as I am! !